Women's Original Back Adjustable Rain Boots is rated 4.4 out of 5 by 111. Designed for a flexible fit the Original Tall Adjustable Boot mirrors the iconic Original Tall with the addition of an expandable gusset at the back. 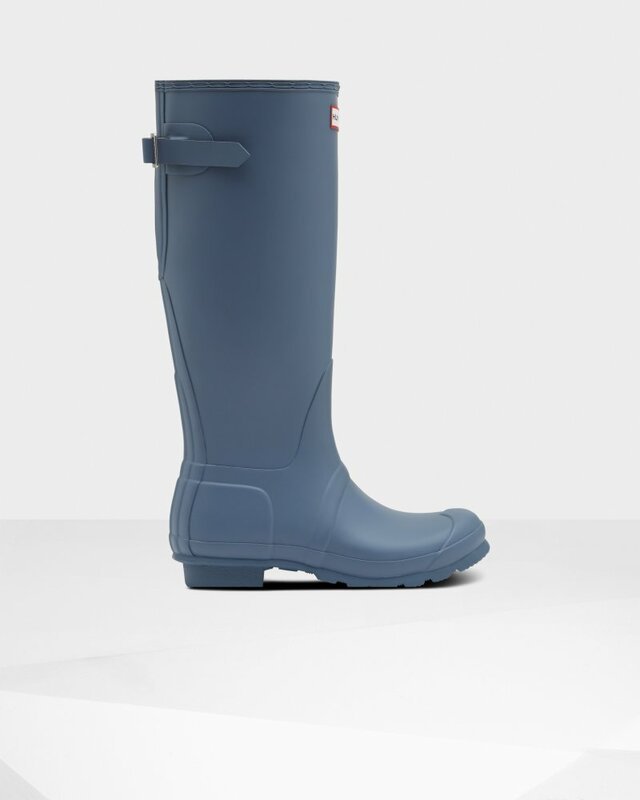 Perfect for a wider calf, these matte gray rain boots offer ease of movement and adjust from the traditional tailored Hunter fit to a more relaxed shape when the gusset is fully extended. Handcrafted from natural rubber, the Original Adjustable boot is fully waterproof with a comfortable polyester lining and the signature Hunter Original tread. Rated 5 out of 5 by Lana1995 from Candy floss pink adjustable back tall boots I have been wearing my boots for two weeks now and I absolutely love them. I have bigger calfs and was scared they wouldn’t fit but I really have to tighten them and they are so comfortable! Rated 3 out of 5 by Seki from Love the boots...but . ( I love the boots but there is a hump in the molding of the right foot that makes it difficult to wear them for a long period of time...and i need to wear these as i have 6 dogs and 2 kids that i have to walk a few times a day in the field(alot of muck and water here) After wearing my right foot really hurts so its disheartening. ( I did recomend these boots to a few which they did but and no one has that hump....they love their boots. Rated 5 out of 5 by Sambunny from Pleasantly Surprised I just received these boots an hour ago. I am so glad that I ordered the adjustable version since these boots will be suitable regardless of what weight I am. For reference, I am 5'4 (164 cm) and weigh 150 lb (69-70 kg). Also the colour isn't as light as I expected them to be given the pictures on the site. But I like the colour way more because it makes these boots more versatile for both fall and spring. If they were too light of a pastel purple then it would look a bit odd as a fall boot. Rated 5 out of 5 by Tree23 from Great Fit - Pretty Colour! I bought these after waiting a long time for the right pair and the right sale. These are so fantastic...they are comfy and such a pretty colour! I'm so happy. Rated 4 out of 5 by Lorbroo from Boots After lots of exchanging finally found a pair that fits! Rated 5 out of 5 by PMac from Comfortable and look great I bought these just after the holidays on sale - I love them. Compliments galore! Rated 5 out of 5 by Keltie from Great boots Love my Hunter boots. Excellent quality. They fit wonderfully. I’m usually a size 10 sometimes 11. And I fit in their size 10 great. Love them!